With the flip of a switch, Haysville United Methodist Church was introduced to its new sanctuary on Aug. 6. After a celebratory breakfast in the church’s Family Life Center — including a harpist and what the Rev. Jennifer Whitt called “Methodist mimosas” of orange juice and ginger ale, served in champagne flutes — members of the congregation filed into a darkened sanctuary. It was the first time in more than a year that services were held in the sanctuary, after a spring 2016 roof repair had shaken loose what was determined to be asbestos in its ceiling. That triggered a domino effect that resulted in a new ceiling, remodeled chancel, new flooring, updated sound system and space for two projection screens. The chancel was remodeled to accommodate both the choir — after its loft was removed — and a contemporary praise band, as well being able to completely clear the area, including the communion rail, for special presentations. “One of our aims was to try to make the chancel as flexible as possible, so nothing was pinned down,” said Jelinek, who has attended the Haysville UMC in the Wichita suburb for 49 years. The switch was flipped, with a few “oohs” and “aahs” from the congregation at the beginning of the nearly two-hour service, which combined those who attend Haysville’s traditional and contemporary services. 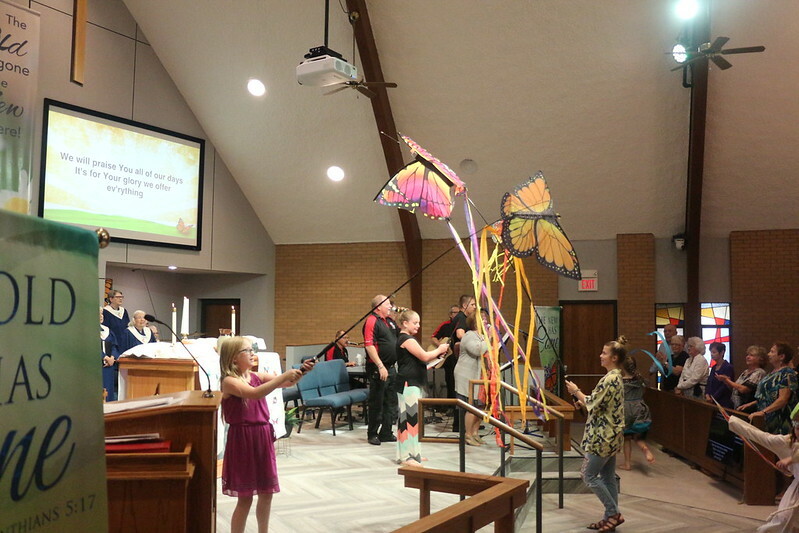 Members of the congregation brought elements to the altar, while youth danced with streamers and others waved large butterflies attached to fishing poles in the opening songs. Butterflies were a part of the theme of the first service, with four banners depicting the rebirth of the former caterpillars. Two of the banners were on a new suspension system with pulleys — unique to the church, Whitt said — that could even be replaced in the middle of the service. Whitt acknowledged that change can be tough, especially for those who had been a part of the congregation since the sanctuary was built in 1968. Jelinek and other members of the building committee were given “medals of valor” by Whitt during the service, with special commendations for the unique skills they brought to the remodeling. Members of the church not only included a retired and current architect, but a construction company employee and a worker in a carpet store. They met weekly on Tuesday nights until the project was completed. In an earlier interview, Whitt said about one-third of the funds from the remodeling came from insurance. The opening service also included communion and a baptism. Videos of greetings from former pastors at Haysville began the service, and on-screen testimonials from members of the congregation preceded the sermon. A new wooden altar and pulpit were part of the chancel, but Whitt said “I’m still gonna preach from right here,” on the floor by the front row of pews. In an emotional sermon, Whitt told the congregation about the death of her father — a 43-year veteran United Methodist pastor in the Western New York Conference — from mesothelioma, a cancer believed to be caused by exposure to asbestos, likely from one of the churches that he served. The new cross suspended from the ceiling and the altar were constructed from material that included lumber that was in her late father’s woodshop, Whitt told the congregation. She also credited the congregation for being there for her after her divorce, which happened shortly after her father’s death and the sanctuary construction project began. “My new life happened right here, because of each and every one of you,” Whitt said.